What is the DL Studio? The DL Studio is a digital production studio and recording space located in Abbott Hall. 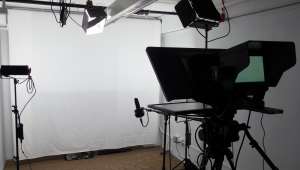 The room measures 9.5′ x 16′ x 8.5′ and is fully equipped with a 4K broadcast quality camera, 24″ teleprompter monitor, tablet handwriting capture system, mini-Lightboard, and professional audio recording equipment for making audiovisual recordings. Studio resources are available for use by SPS faculty, staff, and students in active SPS courses. Full length examples and descriptions of the production style and process are available on the Studio Production Examples page. When should I use the DL Studio? Videos are a key component to many online courses, and the DL Studio allows faculty to create several types. Before you start the camera rolling we recommend that you: consult with a Learning Designer to determine how video fits into your development timeline, access the Video How-To Guides to become familiar with all three phases of instructional video production, view some Studio Production Examples, and read the blog post on Selecting a Video Style before you begin creating a video script. As always, when producing any learning objects, consider student needs first when choosing an appropriate platform or medium for interaction. How do I use the DL Studio? Use of the studio requires the supervision of an instructional technologist. The process for preparing to use the studio also involves planning the video with the help of a learning designer. If you are interested in the studio and are already working with a learning designer, begin by asking them how to fit a studio production into your online course. At this time, studio use is restricted to faculty, staff, and students of the School of Professional Studies. No external requests are able to be accepted at this time. The content produced by the studio requires some additional considerations for accessibility. Video and audio produced in the studio, if not recorded according to a script, will be transcribed for captions. Important visuals should be described textually as best as possible, and it often helps to be descriptive during pre-production/planning and production/recording process. The studio space itself is accessible by elevator and the equipment can be arranged to configure to standing or seated positions. The studio is located on the 3rd floor of Abbott Hall and is accessible by elevator. If you are interested in using the studio to record a video using American Sign Language, please send an email to aaron.bannasch@northwestern.edu.